"Beethoven is a crucial figure in the transition between the Classical and Romantic eras in Western art music, he remains one of the most famous and influential of all composers. His best-known compositions include 9 symphonies, 5 concertos for piano, 1 violin concerto, 32 piano sonatas, and 16 string quartets. He also composed other chamber music, choral works (including the celebrated Missa solemnis), and songs. In about 1800 his hearing began to deteriorate, and by the last decade of his life he was almost totally deaf. He gave up conducting and performing in public but continued to compose; many of his most admired works come from this period." Komponist (1770-1827). Autograph sketchleaf to op. 117, "König Stephan" ("Ungarns erster Wohltäter"). [Teplitz. 2 SS. in Tinte und Bleistift auf 16-zeiligem Notenpapier (322 x 234 mm), zweifach gefaltet. Drei Lochungen im linken Rand (Spuren ehemaliger Heftung). Dabei: Zwei eigenh. Briefe mit U. von Friedrich Wilhelm Künzel in Leipzig an Fred M. Steele in Chicago, . 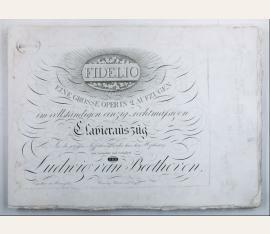 A densely-used two-sided autograph sketchleaf containing music to opus 117, "König Stephan" or "Ungarns erster Wohltäter" ("Hungary's first Benefactor"), the front showing, among other motifs, the opening cello/bassoon line for the beginning of the first movement chorus, "Ruhend von seinen Thaten" (Andante maestoso e con moto, C major), and the verso with material from the end of the movement, all over with various freely written passages in ink and pencil, mostly on single staves, some with text underneath, containing many holograph corrections and instances where ink is written over pencil. - The present sketchleaf, apparently hitherto unknown to scholarship, belongs to a book of sketches that Beethoven used while writing his stage music "König Stephan" in 1811. Beethoven created his own book from various paper on hand and used it while at the spa in Teplitz from late 1810 into mid 1811. He finished "König Stephan" between 20 August and mid-September 1811. The sketches are of the first chorus (after the overture). The musical play was commissioned for the opening of the new theatre in Pest along with "The Ruins of Athens". First performed on 9 February 1812, it was published as op. 117. King Stephen I founded Hungary in 1000. Emperor Francis I of Austria commissioned the new theatre, and Beethoven was chosed as the composer to honour the occasion of the opening. The Austrian Emperor was honouring Hungary's loyalty, thus the subject matter on a text by August von Kotzebue. - The Beethoven-Haus in Bonn holds four other sketches from this sketchbook (viewable in their digital online archive, as entries HCB Bsk 2/50, 3/51, 4/52, and Mh 81), all of which share the same three holes punched on the left-side margin of the present sketch. We would like to thank Dr. Carmelo Comberiati, professor of Music History at Manhattanville College, for his assistance in cataloguing this lot. - Provenance: Friedrich Wilhelm Künzel, Leipzig, before 1886; Collection of Fred M. Steele, Chicago, purchased from the above, 1886. Offered in the "Collection of Important Autographs in the estate of Mrs. Ella P. Steele, widow of Mr. Fred M. Steele" (Philadelphia, 1918). Acquired from the purchaser's descendants, last located in Greenwich, CT..
Komponist (1770-1827). Fidelio. Eine Grosse Oper in 2 Aufzügen. Wien. Gestochener Klavierauszug mit unterlegtem Text. Unbeschnitten. Qu.-Folio. First printing of the first edition of Beethoven's only opera; of the utmost rarity. Inscribed on the title page, in Beethoven's own hand, to his benefactor Pasqualati (1777-1830), in whose house the composer then lodged: "Seinem werthen Freunde Baron von Pasqualati vom Verfasser" ("To his dear friend Baron Pasqualati, from the author"). 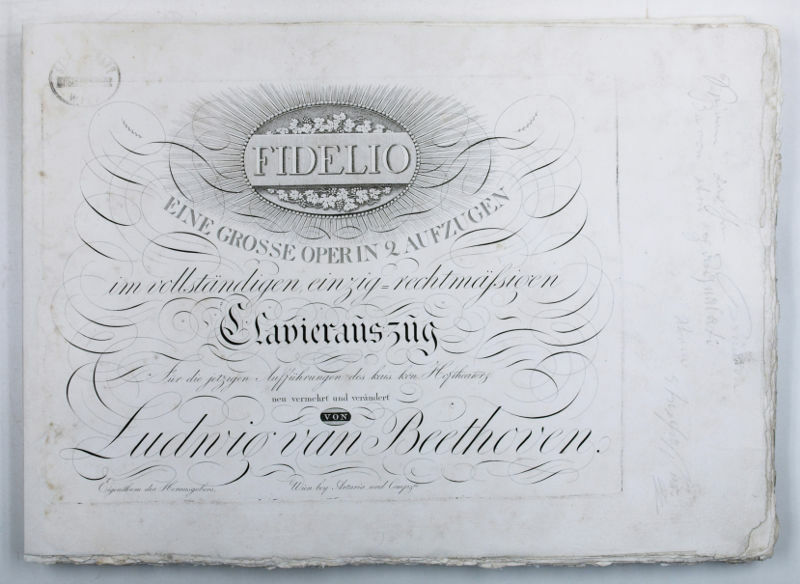 No more than three copies of this first edition bearing Beethoven's autograph inscription are known; the present one is described by Kinsky/Halm as follows: "This copy from the collection of the Society of Friends of the Music in Vienna (cf. no. 893 in the guide-book to the Centenary Exhibition, Vienna 1927) was presented to the conductor Arturo Toscanini by the Austrian Government on 1 November 1934 on the occasion of a performance of Verdi's 'Requiem', directed by him, as a gift of honour (cf. 'Philobiblon' VIII, 6)." - Professionally cleaned with repairs to gutter. Collection stamp of the Society of Friends of the Music in Vienna on title page and verso of final leaf. 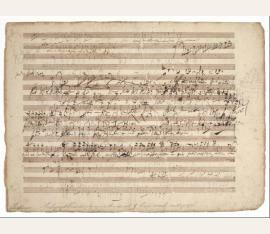 Beethoven's autograph inscription pencilled across the blank margin of the title page. - The present dedication copy was not publicly shown since the great 1927 exhibition in honour of the centennial of Beethoven's death; it was latterly considered lost (as are the other two dedication copies of "Fidelio" described in the catalogue of Beethoven's works). We acquired it directly from Toscanini's estate in spring 2016..
Komponist (1770-1827). 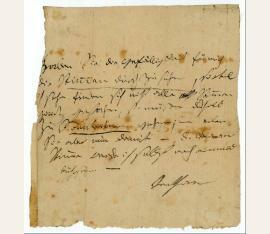 Letter (fragment) signed ("Ludwig van Beethoven"). Wien. 1 S. Qu.-schmal-8vo (80:192 mm). Unter Glas gerahmt. Final part of a communication in a secretarial hand, and signed by Beethoven in full, written to King Frederick Augustus I of Saxony: "..., then the same would be able to predict the best of success for his fame as well as for his benefit." As may be inferred from the date, this must be the invitation to the King of Saxony for subscription of the "Missa solemnis", which was sent to Hans Heinrich Count Könneritz in Dresden on 25 July 1823. - Provenance: last recorded in the trade in 1979 (Stargardt 618, 711). Autograph sketchleaf for the Missa Solemnis containing drafts for the Sanctus and Benedictus and material for the Gloria. The recto of the leaf contains a passage in piano score of modulatory material in D major, followed by a long imitative passage in D and a setting of the words, "Sanctus, sanctus, sanctus, Dominus Deus Sabaoth;" additional material may relate to a setting of "Pleni sunt coeli". 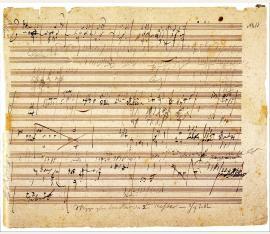 The verso of the leaf continues with triple time material without text; the second half of the page is marked by Beethoven in pencil "2te Theil Benedict[us]" followed by an additional four bars or more in 12/8 time. – Provenance: The present leaf was formerly in the possession of Anton Schindler (1795-1864), noted conductor, private secretary to Beethoven and author of the earliest biography of the composer. 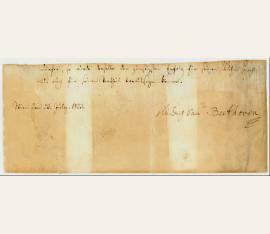 Schindler has annotated one side of the leaf with his identification: "Skizze zum Sanctus der 2ten Messe im 3/4 Takte" (Sketch for the Sanctus of the Second Mass in 3/4 meter) and, on the other side, written "Idee zum Benedictus 2ten Messe" (Idea for the Benedictus of the Second Mass). - A few minor tears to margins. In very good condition overall. - A highly important source, unknown until recently. Not in Douglas Johnson, Alan Tyson and Robert Winter: The Beethoven Sketchbooks, Oxford, 1985 or in Kinsky-Halm. Similar in proportion to Beethoven's large desk sketchbooks (rather than his smaller pocket-books), and in particular to the sketchbook known as "Artaria 195". – According Dr. William Kindermann, one of the most highly regarded authorities on Beethoven: "This is a noteworthy source that documents the genesis of the Sanctus as well as aspects of the genesis of the Benedictus and the Gloria. This sketchleaf was used repeatedly by Beethoven, and although it contains stab holes it is also folded down the middle, indicating that the composer at one point carried it about." Kindermann: Artaria 195 Beethoven's Sketchbook for the Missa Solemnis, pp. 43-46. – "The Missa Solemnis is a monumental work in every sense, and stands beside Bach's B minor Mass as one of the two towering pinnacles in the whole history of the genre. 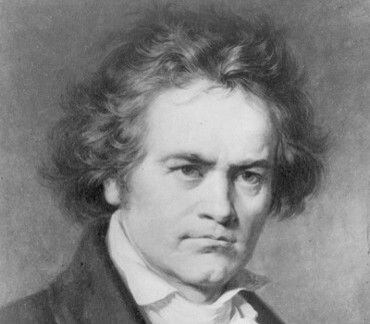 It cost Beethoven more time and energy than any other work, with the possible exception of Fidelio, and took nearly four years from conception to completion [1819-1823]." Cooper: The Beethoven Companion, p. 255. Eigenh. Brief mit U. ("Beethoven"). Probably to Ferdinand Ries, requesting him to proof-read a piano concerto published at the Kunst- und Industrie-Comptoir - very likely op. 37, the Piano Concerto No. 3 in C minor: "Would you have the kindness to look at the parts for me, as far as I see not all parts have been engraved entirely, you will have to see Sonnleitner about that; - but make haste now - I will once more examine the piano part myself [...]." - Joseph Sonnleithner (1766-1835) was a partner in the Vienna "Kunst- und Industriecomptoir", publisher of op. 37. The composer and pianist Ries (1784-1838), student, secretary, and friend of Beethoven's, frequently assisted his teacher with such proofreading tasks during his first stay at Vienna during the years 1801-05. "If Ries is indeed the addressee, then this letter must refer to the first proofreading of the original edition of op. 37 [...] The engraving of this original edition of op. 37 was probably not begun until after the performance by Ries, on July 19 or 26, 1804, after the definitive text of the concerto and, in particular, the solo voice had been prepared [...] It could not have appeared before the second half of September 1804" (cf. Beethoven, Briefwechsel GA). On July 19 or 26 Ried made his piano début in the Vienna Augarten, performing the Piano Concerto op. 37, Beethoven's only piano concerto in a minor key. - Slight edge defects, some brownstaining; torn off closely on the left edge (barely touching the writing). Includes old collection folder and an old typed transcription (carbon copy). Provenance: in the collection of Miss Emilie Schaup (d. 1942) in 1927.